Translates a BVH files to LindenLabAnimation format. Definition at line 48 of file llbvhloader.cpp. Definition at line 112 of file llbvhloader.cpp. 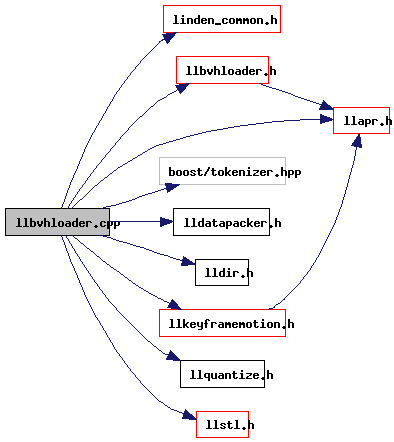 Referenced by LLBVHLoader::optimize(), and LLBVHLoader::serialize(). Definition at line 97 of file llbvhloader.cpp. Definition at line 56 of file llbvhloader.cpp. Definition at line 57 of file llbvhloader.cpp. Definition at line 50 of file llbvhloader.cpp. Definition at line 53 of file llbvhloader.cpp. Definition at line 51 of file llbvhloader.cpp. Definition at line 54 of file llbvhloader.cpp.